If you have read the previous two books in this series then you know the lives of Violet, Klaus and Sunny Baudelaire are anything but happy. This book continues to follow the sad lives of the Baudelaire orphans who are now onto their third guardian after their parents died. After Count Olaf has made two attempts to get his hands on their fortune and committed murder in doing so we are left asking ourselves is there any lengths he wont go to in order to get his hands on the Baudelaire fortune? Mr Poe has taken the three children to live with their Aunt Josephine, the children soon learn that Aunt Josephine is afraid of everything from realtors to telephones to cookers meaning she never serves hot food for fear of turning on the oven. With a hurricane on the way and Aunt Josephine's house being at the hop of a very steep hill and hanging over the edge of the cliff with Lake Lachtymose below could this bring more trouble for the three young orphans. And of course Count Olaf is never far away, Plotting and Planning another scheme to get his hands on the fortune and disguising himself to worm his way into the children's lives. Who will fall victim to Olaf this time. I really enjoyed this book i found myself swept away the characters again, i sometimes find with series especially one as long as this one (13 books in total) you can find yourself getting bored of the characters and the plot lines however, this is not the case with this story. 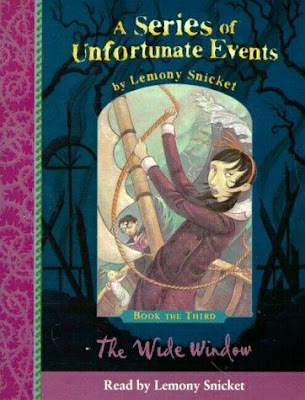 You find yourself really rooting for a happy ending for these poor children and wanting a terrible sticky ending to come to Count Olaf. You find yourself getting more and more annoyed with Mr Poe each time he dismisses the children when they try to tell him about Count Olaf, you think by the third book he would realise the children know what there on about but no still he is blind to Olaf's plans leading Olaf to be able to get away. This in turn makes you feel even more sympathy for the three children. Snicket continues to use his quirky writing technique throughout the books, by talking to the reading directly and explaining the meaning of complicated words. I still find this adds humour to a sad story and fits very well with the book. In conclusion i gave this book 5* on goodreads and would recommend to anyone looking for a quick and enjoyable read. But again anyone looking for a plot with happy endings and they all lived happily ever after this book in fact this series is not for you.